In November 2016, the Indian government pulled high-denomination currency bills out of circulation in an effort to clamp down on corruption and terror finance. Following this, people were forced to stand in long lines outside banks and ATMs to trade in old notes for new ones. Often, the ATMs ran dry by the time a citizen got his or her turn after waiting for hours in the sun. 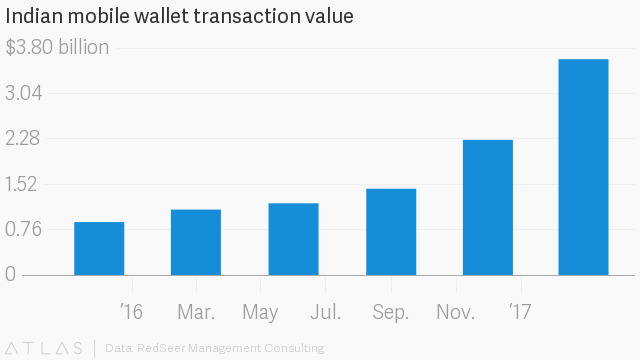 While people bore the brunt, one sector thrived: mobile wallets. The economy, where an estimated 95% of transactions were done in cash, was now looking at a cashless future. From big companies to roadside stalls, a slew of businesses began accepting payments through e-wallets. 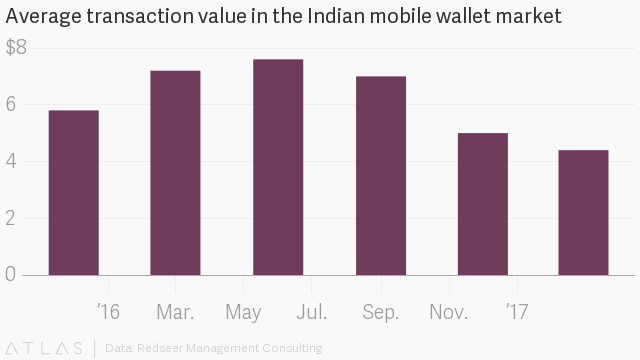 As the Indian economy recovers, mobile wallet payments are continuing to accelerate. Their transaction value of over $3.6 billion in the first quarter of 2017 marked a 60% increase from the previous quarter, according to a new report from RedSeer Management Consulting. Paytm, the e-payment market leader in India, benefited from this surge, amassing over 220 million users. Recently, it secured $1.4 billion in funding from Japanese telecom and internet giant Softbank. After finally receiving a licence from the Reserve Bank of India, the Paytm Payments Bank begins operating on May 23. However, while there has been an increase in adoption, there has also been a decrease in average spend, Redseer noted. The average transaction value was worth $4.40 in Q1 2017, down from $7.20 in the same period a year earlier. Meanwhile, for the continued rise of the overall e-transaction value, smartphone and internet use need to pick up more: The country is expected to have over 450 million smartphone users by June 2017 but half of them aren’t likely to subscribe to data plans. The rural masses tend to steer clear of mobile payments due to language barriers and lack of knowledge about devices, a joint study by philanthropic investment firm Omidyar Network and Dalberg Global Development Advisors found. Cultural norms and a lack of financial autonomy also deter women from using digital finance services.